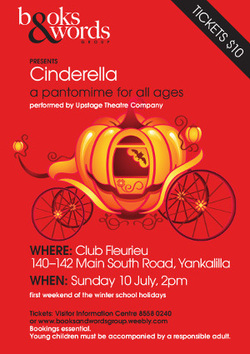 “Cinderella” is one of the best loved of all fairy tales, and Upstage Theatre is proud to present their very own version of this story for the July school holiday pantomime season. All the traditional story characters appear but with this musical troupe’s own brand of humour and original catchy lyrics will have the audience toe-tapping as usual. With the classical Cinderella, and the ever-popular Prince Charming who teams up with his manservant Arthur and make a handsome duo. And of course this Pantomime would not be complete without the two delightful if somewhat appallingly ugly sisters. Also we have the henpecking wicked stepmother who gives the audience a good target to boo and hiss at. Lots of audience participation is supplied by the lovable Buttons and to finish off this delightful fun filled Pantomime we have cameo roles from Salt and Pepper, Cinderella’s pet mice which makes this a true holiday treat. The show has been beautifully costumed by Violet Rowe with fine direction by John Martin.